The use of tear gas on crowds of asylum-seekers is only the latest attack in an ongoing war the Trump administration has launched at the border. The big picture: Trump campaigned on drastic immigration changes, including building “the wall” on the border, but Congress is nowhere near passing any sweeping immigration legislation and the Trump administration is struggling with a surge of asylum claims, chaos at the border and a record number of unaccompanied minors. The family separation policy is over, and the majority of immigrant families have been reunited. But the Trump administration is still dealing with another child migrant crisis: There are around 14,000 migrant minors in government custody, but they don't have the proper space to hold and care for them. What was supposed to be a temporary shelter is quickly turning into a permanent tent city in Tornillo, Texas. Its tents currently hold 2,349 mostly Central American boys and girls between the ages of 13 and 17 — more people than are held in all but one of the country's 204 federal prisons, according to AP. While Health and Human Services works to find family members to care for the children instead of keeping them in shelters, some advocates worry that reports of ICE arresting immigrants who came forward to do so are scaring off other caretakers. Caravans of thousands of Central Americans have been making their way through Mexico, and many have landed at the southern U.S. border in Tijuana. What was once thought to be a midterm political play for Trump to stoke his base has become a logistical nightmare as border agents grapple with how to handle the hoards of asylum-seekers. 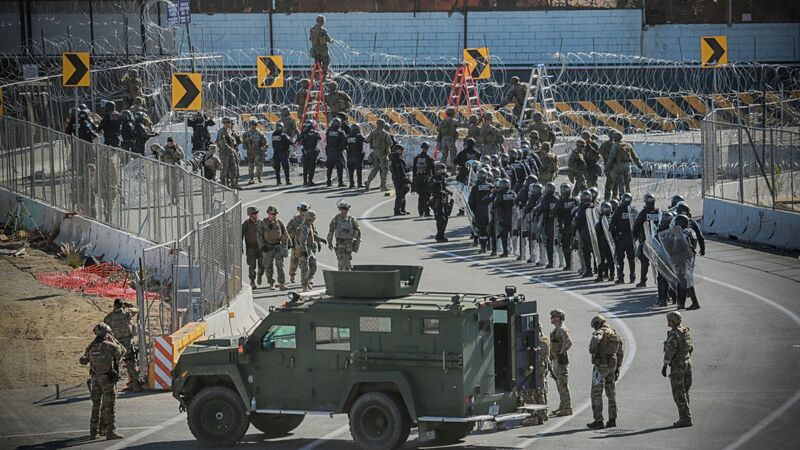 Around 5,900 troops were sent to the border in preparation of the caravan's arrival, and White House chief of staff John Kelly signed an order that would allow the troops to use force in defending border agents. Over the weekend, border officials launched tear gas into crowds of these migrants allegedly in response to thrown rocks. Images of children and families choking on the chemical sparked outrage among humanitarian groups, Democrats and some Republicans. Border officials have had to close a border crossing from Tijuana, and many immigrants may be forced to wait weeks or months in Mexico before being able to submit their asylum claims. Mexico may enter into an agreement with the U.S. that would require all asylum-seekers to remain in Mexico until their cases have been decided, the Washington Post reported. The Mexican government has denied that any such agreement has been reached. Several of the Trump administration's efforts to curb immigration have been stopped by the courts, the most recent being a proclamation that would have automatically disqualified anyone who crossed the border illegally from claiming asylum. A federal judge has issued a temporary restraining order blocking the measure. The courts also repeatedly stopped Trump's travel ban — although it was ultimately upheld — and an attempt to end the Obama-era DACA program.